After the surgery, a number course of skin resurfacing treatments are usually recommended to perfect the results of this minor surgery. 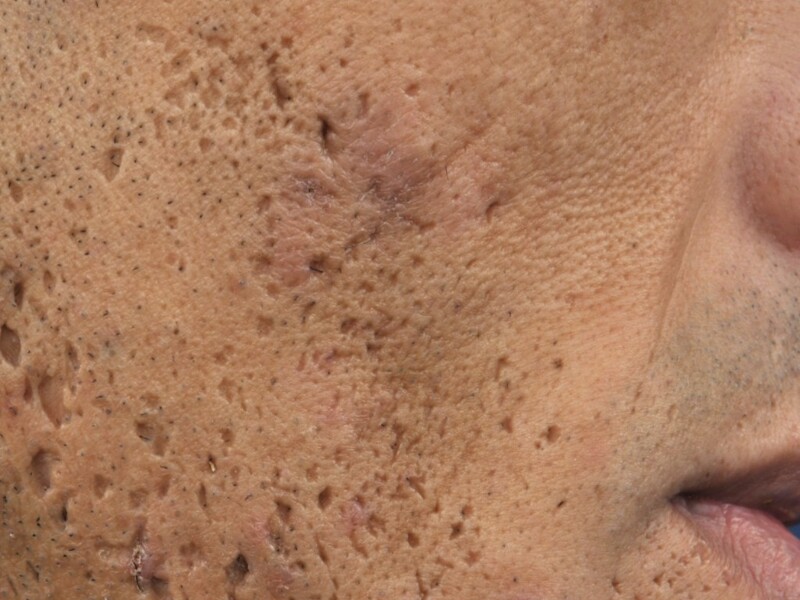 The main challenge in improving the appearance of atrophic scars in general, is how to regenerate the missing part of the skin that creates the “hole’ in the skin. This is particularly challenging if the atrophic scars are quite deep. Typical acne scars. A plastic surgeon may decide to perform a number of subsicions to raise the depressed areas of the individual atrophic scars. The procedure is quite time consuming but simple. Subcision is a technique used in order to raise the depressed area of the individual atrophic scars in general. This is done inducing another process of scarrification. Essentially the atrophic scar is carefully cut at its bottom and a wound is purposely formed which is left to heal. The natural scar generation process will produce extra collagen which in turn will raise the previously depressed area of the atrophic scar. The scabs will form three to four days after the procedure. The scabs should fall off by themselves within 5 to 7 days and the results are typically very good. After this type of simple surgery the improvement is normally visible however further aesthetic treatments are usually recommended to correct the minor imperfections left after the surgery. In other words, surgical subsicion is used to coarsely improve the appearance of the scars and other aesthetic treatments (skin tightening and skin resurfacing) normally follow to fine tune the results. Normally a number of skin resurfacing sessions are carried out once the area has recovered fully. This will allow to smooth the remaining imperfections after the treatment. The skin resurfacing can be carried out by using cosmetic leasers, voltaic arcing, or a number of treatment of cosmetic peels. Subsicion is a simple technique and it is masterfully explained as shown in the following video. Always remember that acne scars are generally difficult to remove completely, therefore improvement of their appearance is considered to be the most appropriate expectation for this type of aesthetic treatment. 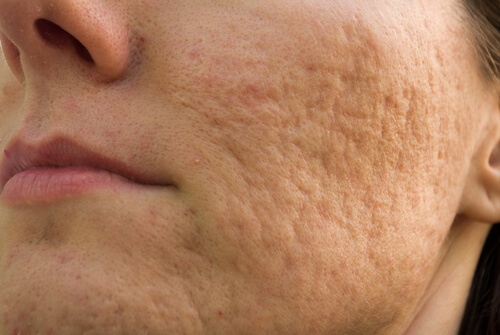 No treatment both surgical or non surgical can guarantee complete disappearance of the atrophic scars (or Acne Scars). This technique (subsicion) is preferred when the atrophic scar is not very deep. In case of particularly deep scars, “ice picks scars”, the technique preferred is minor localised skin grafting. Minor Skin Grafting or Punch grafting (floating) . Skin grafting is used in many areas of skin reconstruction and it is particularly useful and effective in reconstructing the missing skin on a “Ice Pick” type of scar. Typical Ice pick type of depressed scar. Minor skin grafting is a very good option for reconstructing the missing skin. As seen in the picture above ice pick scars are particularly challenging to tackle because of the amount of skin that is missing. Therefore subsicion would be quite difficult to carry out as it can be even impractical given the depth of “Ice Pick Scars”. Punch grafting/floating can be used in these cases. Small skin grafts are used to replace acne scarred skin. Sometimes used to treat deep, ice pick scarring, punch grafting provides the most optimal results in less mobile areas of the face such as the forehead. Punch floating is the treatment of choice for most ice pick scars and usually heals in several months without a trace of the circular incision used to make the punch. In this video we can see how skin grafting is used to regenerate the missing skin of the depressed area of an atrophic scar. Skin grafting in this particular application consists in using skin elsewhere on the body and placing it in place of the missing skin on the atrophic scar. The surgeon deliberately inflicts a wound to the ice pick scar. Once the wound is made, the small skin graft (punch graft) is implanted on to the fresh wound and stitched up. The stitches are removed within 15 days. In this case skin grafting is done by trying to implant new skin on the acne or atrophic scar in general. A wound is usually inflicted intentionally on each deep scar and the new skin is implanted on the fresh wound. Then each scar treated is individually stitched up and left to heal in the hope that the “skin transplant” will be effective.